Find the recently released PIM Motivation Letter in the News & Events section. 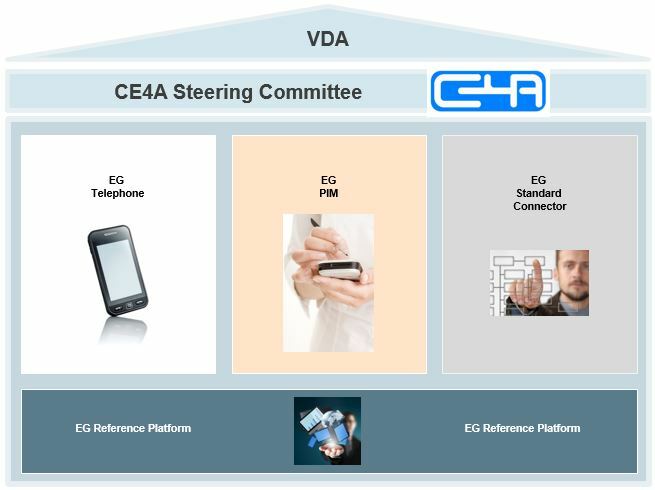 CE4A (Consumer Electronics for Automotive) is a working group of car manufacturers promoting an active standardisation of mobile device interfaces. Based on an initiative of five German car manufacturers first steps were taken towards a standardisation of the interfaces between mobile devices and automotive ECUs. As a result of this initiative the working group CE4A was founded. Since May 15th 2007 CE4A is an authorised member of VDA (Association of the German Automotive Industry). CE4A is organised in four expert groups (EG) each involved in different areas of expertise. Common activities are regularly coordinated and directed on management level in steering committees.